I don’t think I’d call Kingdom Hearts 1 a self-contained story, because of the ending leaving a lot to the sequels, but it’s probably one of the most straightforward stories in the series. It’s told in a simple way, but it belies complex, nuanced things about growing up and responding to change. It was really good at kicking off the story and giving perspective to the trio’s sudden coming of age and having their world turned around. I joined the fandom kind of late, so I don’t know if this has already been done to death or not, but at least from opinions on Kairi and, to a lesser extent, Sora, I’m guessing it hasn’t really. KH1 is a story that sets up each of the members of the main trio as wet behind the ears, kids who were thrown into more than they bargained for, kids who were changed by it. Riku’s a play on the usual villain, Sora’s a play on the usual chosen hero, and Kairi’s a play on the usual damsel. Riku’s arc is most obvious. He’s the best on his islands, the strongest, the smartest, the most adventurous, and everyone talks about how capable Riku is and how Kairi won’t have to worry about anything as long as he’s around. Riku’s a protector, and he’s the best –those are important aspects to his self-image. And the islands are too small for him. He’s strong, but never strong enough, but there’s nothing on his islands that he hasn’t seen enough of. There’s more out there, and his desire to see it and grow from it and lead his friends to it is so sincere that it’s changing him. So he does whatever he can. A raft can only take them so far, so he “thinks of something else,” something that’s been on his mind since he first saw the keyhole. But he made a mistake –despite his expectations, neither Sora nor Kairi was there. And the next time he meets Sora, Sora’s already got new friends and can stand on his own two feet, even though Riku’s always been the protector and the best. And then Riku’s fall to darkness, his defeat, his regret and desire to at least see Sora and Kairi one more time if he was really dead, it’s all well-known and straightforward, especially with the new scenes in the Remix, I really don’t need to go into it. He sought freedom the most, and ended the game by giving up his freedom and becoming effectively trapped in a much worse prison than Destiny Islands ever was. Sora’s is subtler, but his character arc is there, too. Sora’s excited to see the outside world because it’s adventure. Sora’s the not-as-good-as-Riku, the laid-back, happy-go-lucky kid who will do anything for his friends. He’s pretty simple minded and easy to read. His growth is all about expanding his horizons. He didn’t hate the islands or think of them as some prison, but he did want to see all the worlds out there. He didn’t care about saving the worlds or finding Donald and Goofy’s king at first, though. He went along with them solely because the others told him it might be a way to help him find his friends, even though Donald didn’t care either way if they could or not. Sora has his moments of weakness, sadness, and confusion, but he tends to downplay them and put on a smile in most of those times. Through seeing the other worlds and meddling, he gained more connections than he ever had on his little island. The climax of that came when he said that his power came from his hands, who would be with him no matter what –and used that line against his long-time best friend, himself. Sora’s a play on the usual hero because he didn’t care about saving the worlds or abstract things like that. He cared about the relationships he eventually developed, and that’s what made him want to help the worlds and that’s what gave him his power. Despite being built on the power of friendship, he’s willing to call out and fight his best friend, and despite having the least personal reason to seek outside worlds, his horizons where the ones that were extended the most. You know, I was a little afraid at first, but now I'm ready. No matter where I go or what I see, I know I can always come back here. Right? It’s usually ignored, but Kairi had a character arc in the first game, too. She’s introduced as a carefree, playful tomboy that both Sora and Riku are implied to have feelings for, but there are hints that imply that she’s more insecure than she lets on. It implies it in her introductory scene, where she hesitates and loses her smile before she reiterates that she remembers absolutely nothing about her hometown, in her talk with Riku while they were sitting on the paopu tree, and most obviously in her talk alone with Sora where she admits to sensing a change in Riku and tries to get a reaction out of Sora to see if he senses it, too. These hints imply that Kairi’s claim of “remembering nothing at all” about the world she grew up in may not be entirely true, and she later goes on to show nostalgia at the picture of a castle, share a memory of her grandmother with Sora, and admit that Hollow Bastion was her original home, although she also admits that she doesn’t remember much about it anymore and considers Destiny Islands her true home. It was mostly illustrated in the scene at the pier with Sora, that she has a deep-rooted fear of change and wants to just be assured that nothing that changes will be permanent. She wants to go visit her original world, and her heart feels warm when she’s in Hollow Bastion again, but before they leave, she’s torn between the desire to go back to see her old home and the fear that she might lose the new home she’s come to love. She asks two things of Sora: (1) for him to never change, and (2) for reassurance that no matter what happens, they can always come back there. She’s even making a charm to keep the three of them together, no matter what might happen. Kairi’s stuck together with Sora for the whole game, and seems to remember it all, or at least to some degree, and says that she made it that far by sticking together with him. She talks to him, cheers him up once or twice, and shares her feelings. Kairi still doesn’t make it clear how much she knows about at the end of the game, and she still wants the three of them to just stay together and for things to be how they were before, but the end of her arc in the first game is about her learning that change will always happen and coming to accept that in one way or another, as long as their bonds could tie them all together at the end of the day. The entire ending sequence focuses Kairi, and Kairi says the last line of KH1. She’s clearly at peace with Sora having to leave her life because she knows that the bond between them remains and that it will bring them together again someday, and together with Riku, too. The character arcs aren’t as full in themselves as Riku’s full arc, of course, they’re all just the starting points for the main trio that flesh them out as three-dimensional and show who they are and where the coming of age changes left them. Riku was left in a dark place, Sora was tasked with going to find him, and Kairi was separated from the people she loved again and left to wait in a lonely but familiar place, as she's basically the token normal by the end of the story. Riku's been searching for his way back to his light and back to everything he pushed away before, Sora's been expanding his connections and making more friends, and Kairi's become more estranged and is trying to keep things together, although of the three, Riku's the only one with a fully realized character arc as of yet. Riku is the classic angsty character archetype who seeks power in order to protect his friends, but becomes corrupted by said power and ends up harming his friends, paying for his mistake, and starting on the path to redemption. Other examples of characters with this arc are Terra (arguably), or Kaneki from Tokyo Ghoul. But the play on the formula was that once Riku saw Sora doing just fine with Donald and Goofy, he felt that he was unneeded as a protector and thus useless. This enraged him, inverting his character to one who destroys instead of protects and turning him against Sora. But with the reveal of Ansem's plan, he realizes that his own selfishness, his need for power and to be recognized as the strongest, actually hurt his friends. 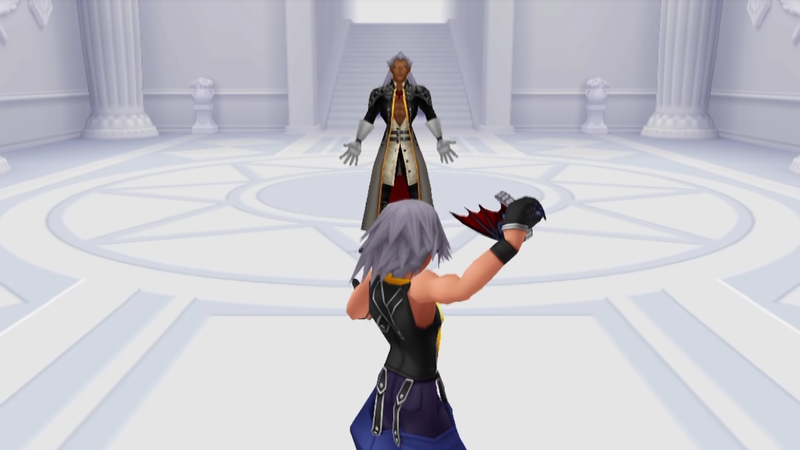 From that moment on, he begins fixing his mistakes by attempting to control the darkness and defeating the Ansem within him so he won't hurt anyone else. He becomes selfless, as seen by his sacrifice in locking the door to hearts and how he spends his days aiding Mickey and Diz. He works from the shadows, restoring Sora to consciousness and helping in other ways without any need for recognition. He overcomes his character flaws, his greed for power and recognition. This completes his character arc, which ironically, makes him the strongest of the original three and allows him to obtain the Mark of Mastery in 3D. Riku's character arc is definitely the most thorough, as it is the only completed one. As you said, Sora's character flaw in KH1 is that he is too narrow minded and childish. At first, he only cares about his friends, not about his destiny, finding out what is going on, or the fate of all worlds. He is only along for the ride because he wants to find Riku and Kairi. But he was already selfless due to him being too childish and carefree to be selfish. This is shown by his self-sacrifice for Kairi and his willingness to go to any extremes for his friends. But as he meets and helps more people through his journey, he learns that there is something more than the life he had before. He expands the love and selflessness that he had for his friends to all people, which is what allows him to save many worlds from darkness and embody the hero archetype. Honestly, it is surprising that there is any darkness in his heart that would allow him to become a heartless. However, as was shown by his failure to attain the mark of mastery, his character arc is not yet complete. He is still quite immature as he rarely shows much serious emotion and is the one to make silly jokes at serious times. Kairi's arc is where the reaching really begins. I would say that she has issues with abandonment and codependency. This stems from her being cast out into the darkness alone after her home was destroyed at a young age, which is bound to be traumatic. So when she washes up on Destiny Islands (apparently with no parents) she becomes attached to and dependent on Sora and Riku. She is never seen by herself, and on the island she is the one to seek Sora and Riku out to do something. So when Destiny Islands was destroyed, her heart finds Sora so he can protect her, because she feels that she isn't strong enough withstand the darkness alone, regardless of being a Princess of Heart. So she spends the rest of the game playing the role of the damsel in distress, while always relying on Sora to keep her heart safe. It should also be noted that Kairi's weakness fed into Riku's protector persona. However, it seems that being inside Sora throughout his journey influenced her to become more independent. This is because when she is revived through Sora's sacrifice, she takes matters into her own hands by standing up to the other heartless and realizing her role as Princess of Heart by pulling Sora's heart out of the darkness. Wow, this is a really interesting, in-depth analysis! My favorite part of this is your section on Kairi. You're right, she does have depth in KH1, it's just subtle, especially compared to the other characters. She clearly has some issues regarding change (hence the raft comment) which she tries to mask, which is something I wish the games explored more. Because she gets such a small amount of screen time, most people (myself too, occasionally) tend to forget it. Fantastic job! ...basically articulates every point about why I like Kairi as well as why she's actually pretty interesting in one post. Damn, MegaWallflower. You did it. Oh, wow, I had almost forgotten about this, haha. I'm not very good at speaking articulately, so I'm really glad you guys could understand what I was saying despite that! Have you done one for KH 2? I wrote out this because I recently watched a playthrough of all of KH1, so I haven't done the same for KH2. I'll try to get around to watching a playthrough of KH2 sometime so I can gets my thoughts in order, then. I like this. It's a veryy good character analysis... now do MORE! I would love to see your take on BBS. Notice how all it takes is to put yourself into another person's shoes and you can decipher & understand what these characters truly are. If you actually decide to do KHII, include Roxas, because he has one of the best realistic personalities in the series. With this you can discover what he longs for and how he can achieve it, like you did with this thread. Ooh, very, very interesting take on the characters. I have never thought about Kairi that way, and know I feel like I appreciate her more. If you manage to watch KH2(the FM version of course) I would really like to read your thoughts about it! Well, this was quite the analysis. Excellent job, MegaWallflower. All three arcs that you illuminated were interesting, but Kairi's most of all since hers was the hardest to see considering how little screen time she's given in every game after this. It's refreshing reading about an analysis that reflects more on Kairi herself rather than on her being a Damsel in Distress for Riku and Sora to save. I had my suspicions about her insecurity due to her dialogue with Sora at the pier, but the fear of change aspect was something that I didn't really pick up until recently and even then, it wasn't fully articulated until you out it into words here. I once posited that Kairi might be part of a diaspora of other people that were somehow sundered from Radiant Garden. It would be very interesting to see how she interacts with everyone in Radiant Garden if and/or when she arrives there come Kingdom Hearts III. It's even possible that she may have even known some of the people from there or at least spent some time there (i.e. : Merlin, Scrooge, Leon, Cloud, Yuffie, etc. ), but might not necessarily remember all of them and such. At the very least, I'm interested to see how she interacts with her grandmother, assuming she's still around after eleven or twelve years. I've never seen Tokyo Ghoul, myself, so I can't comment on that, but Riku and Terra's path are very similar, which is why I guess you could say Terra saw himself in Riku. At least, their seeking power for the sake of being strong enough to "protect the things that matter" was similar, but past that there is a lot of divergence, of course. Rather than turning entirely from a protector into a destroying after seeing the betrayal of Sora --one of the people he'd vowed to himself (and to Terra) that he would always protect --he also clung to his role as Kairi's protector. So his destructive tendencies were for the sake of desperately holding onto the role of protector to the one person who still needed him, and trying to make Sora the weak, helpless kid who still needed his protection again. Sorry I skimped on Riku's character analysis here. If you want to see a better one, Audo make a thread that's much more in-depth about KH1 Riku. I completely agree. Sora's not quite selfless to begin with, at least not like the typical hero archetype is. He's willing to do anything for his friends, but they were the only things on his mind at the start, as the biggest reason he went along with Donald and Goofy was to find Riku and Kairi, but he certainly became pretty selfless by the end. I don't know if I was reaching or not, but I think everything I said had basis in the game itself. The smile was a small thing, but with the reveal that Kairi remembers somewhat more than, "No, nothing," I just figured that it was an early hint at that. I'm not sure if you mean codependent as in the dysfunctional, psychological term or not, but Kairi's alone while they're gathering supplies and the night of the storm. Nomura confirmed that she felt the subtle distance and loneliness that you feel with your friends when you're growing up, but she's not particularly clingy, she just wants the trio to stay together about as much as Riku and Sora do. She might very have some sort of issues with abandonment, though, or at least a need to feel grounding in something/someone she can return to after losing her first home. Although it's implied she remembers some things, it's never made clear if she remembers what happened the night she was sent off or not. Not diagnoseable abandonment issues, just a fear of losing everything again, hence her talk with Sora. Her heart ending up in Sora's could be said to be because of Aqua's spell or it could be because she was 'waiting' for him there. It's hard to say which it is, though. She doesn't actively seek out protection, otherwise. Sora protecting her heart was passive, and the times she called out to Sora were either random (in Deep Jungle and in Merlin's house) or a way of encouraging or alerting Sora. She hesitates running out and leaving Riku and Sora behind, and fully expects to go back with Sora when he's going back to find Riku. Riku has to tell her to run, then Donald and Goofy have to tell her that she can't go back for them, then Sora has to tell her to stay and wait for them. Her pulling Sora out of the darkness was less her realizing her role and more something that seemed completely accidental. You madam hit it right on the head. I'll always content that Sora after Chain of Memories was a step back but in KH1 and even a little in CoM he had actual development. His friendship with Donald & Goofy, lessons he learned in worlds, it was all done subtly and beautifully in KH1. Only for the rest of the series to throw it out or play it down to difficult recognition.